Talking with students in class day in and day out, you might be used to shifting your body from facing students for showing an object and having a discussion, to facing the blackboard to write down notes for students to copy onto their notebooks. But is this how it should be done? Shouldn’t there be a more efficient way? Shouldn’t the class be able to focus more on the valuable discussions that inspire critical thinking rather than spending much time writing down the notes? In the previous article about the Diggiditto™ Smart Document Camera, the unique Image Recognition feature of the Diggiditto was explored. This time we’ll talk about its annotation software that enables you to write notes and draw figures on top of the image shown on the computer screen. These newly created images with notes and drawings can be saved onto your computer and/or printed out and distribute to students once the discussion has ended. No more valuable discussion time being wasted on jotting down the notes. The annotation software of the Diggiditto provides you with a palette of the following once the Pen icon is clicked along the top toolbar: Pointer, Pen, Transparent Marker, Figures, Eraser, Thickness, Color, Background, Save, and Print. 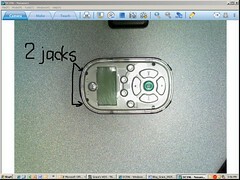 Using the computer mouse, these powerful icons allow you to quickly write down notes on top of the image presently shown on screen. By pressing the Pen button, you can erase any part of the notes or highlight a specific area with the Transparent Marker. Drawing a figure with lines, triangles, circles, and rectangles can also be created by pressing the Figures key. The Color button changes the color of the pen, marker, or figures while the Thickness icon allows you to change thickness of the three. 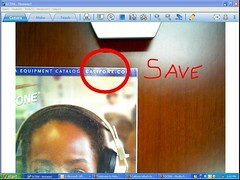 With the Save and Print buttons, you can save the complete screen as a jpeg file or simply print out everything shown on the screen. This makes keeping real-time notes or class progress effortless. Want a different background to separate various topics/themes? The Background icon gives you four practical backgrounds: blackboard, staff paper, engineering paper, and white; quickly expanding the options on presenting notes or data. The Pointer button brings you back to the original, unedited screen. Make notations or shapes over top of whatever is shown on the screen. These small icons make a big difference in class preparation and student learning. You no longer need to prepare the notes separately via different means, and students have access to the notes without dancing their pens on the notebooks. More importantly, everyone gets to focus on the discussion, improving interactivity and learning. Whether it’s a brain storming session or a group debate, everyone’s inputs could be easily recorded; any specific notations could be written right next to the related part of the image, and data could be organized by groups right on the spot via various colors and figures. Saving student comments can also help boost their self-esteem since their comments aren’t just heard by everyone but also written onto the screen, saved, and later distributed as part of the class notes. This feature also encourages constructive input and creative thinking among groups as they can see exactly where they stand comparing to other groups at any given time. The effectiveness of this “write on” feature doesn’t end as the school bell rings or when the lecture is over. The saved or printed screen notes can help students reconnect to the details of the class discussion when they review it later. It can make physics formulas, math equations, sentence structures, geography or history studies, and other classes less intimidating and more interactive and “user” friendly. Go ahead and have a blast with the class; with Diggiditto, you know it’s alright to write on it! Read the next article about the “Talking Document Camera“.